Heat oven to 325°F. Generously spray 12-cup fluted tube cake pan with cooking spray. In large bowl, place cake mix. In medium bowl, beat sour cream, oil, milk and eggs with whisk until well combined. Pour wet ingredients into cake mix; fold until completely combined. Scrape batter into pan; spread evenly. Bake in center of oven 55 to 60 minutes or until toothpick inserted near center comes out clean. Remove from oven to cooling rack; cool about 10 minutes. Place heatproof plate upside down over pan; turn plate and pan over. Remove pan. Cool completely, about 45 minutes. Meanwhile, puree 6 oz raspberries in bowl with immersion blender, in food processor or in blender. Add cream cheese, half-and-half and powdered sugar; blend to combine. Pour glaze over cooled cake. 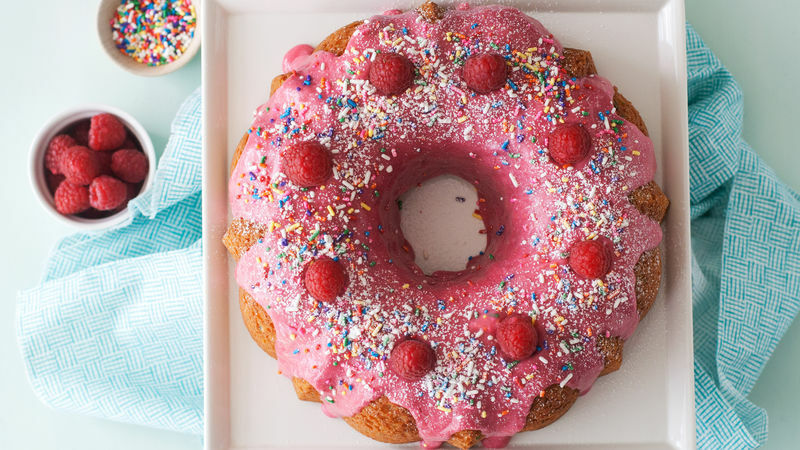 Decorate with additional raspberries, candy sprinkles and additional powdered sugar. Store in refrigerator. The cake can be kept, covered, in plastic in the refrigerator for a few days after baking and glazing. To keep the glaze from sticking to the plastic, place 5 or 6 toothpicks spaced evenly apart around the cake, then cover with plastic wrap. Be sure to cool the cake completely before pouring on the glaze or the cake will soak it all up.